...of your tax dollars, to give people low down payment loans on houses they can't afford. Stocks are slightly positive with a couple of hours left in the trading week. Among gainers is CKE Restaurants (CKR), owner of Carl's Jr. and Hardee's, up 25% on news that they'll be LBO'd by Thomas H. Lee Partners. THL is offering $11.50 per share, a 24% premium to yesterday's close. 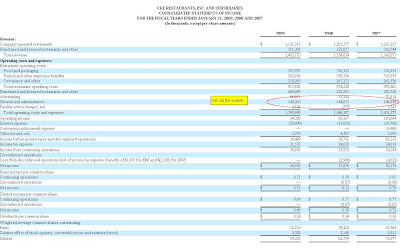 Embarrassing for CKR is the fact that they're selling the company for about .34 times sales, while Burger King, Jack-in-the-Box, and McDonalds' enjoy P/S of .96, .47, and 3.05 respectively. 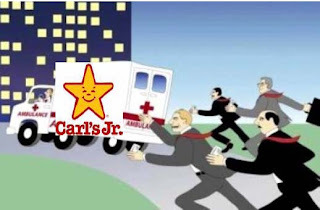 That cheap valuation is likely why the ambulance chasing securities lawyers have whipped out their robo-lawsuit machine, which spits out lawsuit invitations within minutes of every single buyout announced, with the laughable due diligence work of quoting a higher analyst price target. To be fair, the company likely DID sell far too low...but that's the risk you run with a high insider concentration of illiquid stock. Among losers, Crocs' (CROX) CEO departure is hitting shares today, sending them down 14%. Investors were stunned by the announcement, as CEO JOhn Duerden has been on the job only a year. Faction team rider: Mike Mertion from Peter M on Vimeo. Shares of The Gap (GPS) are +5.5% this Friday morning, after reporting a q4 2009 earnings beat and offering upside 2010 earnings guidance last night. The company announced additional share repurchase plans, and a boost in the dividend gives the stock nearly a 2% dividend yield. I've liked this stock since last May, for two main reasons. 1. CEO Glenn Murphy is a fantastic operator who is widely under-appreciated by Wall Street. 2. The company's valuation, both on a P/E and Free Cash Flow Yield (FCFY) basis is too cheap. In 2009, The Gap's focus on sourcing and their diligent promotional stance helped gross margin increase to 40.3%, almost 300basis points higher than the previous year. 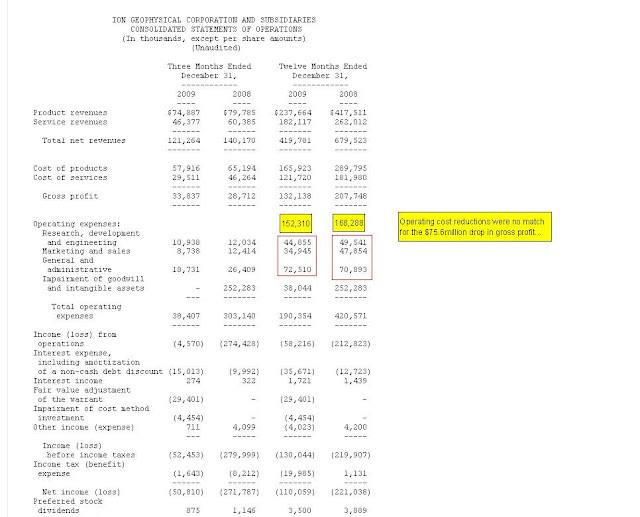 This gross margin increase comes despite a 2% decrease in comp store sales (sales from stores open at least a year). That gross margin allowed operating income to increase to 12.8% from 10.7% in 2008, despite store-level costs increasing. The expectations for 2010 were mixed going into this call. One key question the street has is whether the increases in operating margin are largely behind the company, or if there's still room to improve. For their part, management still sees room for improvement, guiding 2010 to an operating margin of 13%. 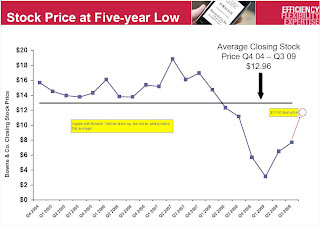 Some upside may come from an improvement in sales per square foot, which decreased again in 2009. The company confirmed expectations that 2010 will be a year in which they aggressively go after market share, meaning they might give up some gross margin to get those new shoppers. Oppenheimer was very impressed with Gap's 2009 performance, greatly increasing earnings despite sales being down. That said, they are not fans of the stock at current levels. 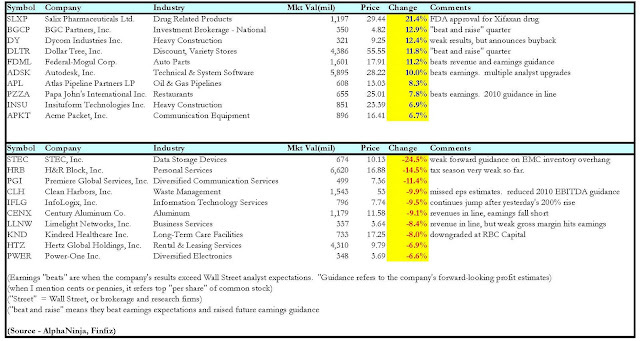 Wedbush likes the stock in 2010 and sees upside to earnings estimates. They think the company's targeted promotion, international expansion, and new store prototypes could boost results. Deutsche Bank sticks with their Sell rating, as they think this year's forward estimates are too high. They give the stock an 11 P/E ratio, and apparently do not add back the cash per share. I think the stock will trade at 15-17 times trailing earnings estimates by the end of 2010, and adding back $3.70 per share in balance sheet cash puts the stock near 30. As other investors warm to the story - a fantastic CEO turning around a former category leader, with the extra kicker of a dirt cheap valuation and prodigious free cash flow generation - the stock will head up. Grocery-store operator Safeway (SWY) opened for trading this morning down 4.3%, at 22.50. The shares then proceeded to climb 10% from that level to close at 24.73, a +5.2% gain on the day. Along with the broad market being down early, some investors may have sold the stock on the headline news that Safeway lost $4.59 per share or $1.609billion in the fourth quarter 2009. Over the last few years, Safeway embarked on a big push to transform its stores to a new “Lifestyle” format – essentially redecorating and remodeling stores, with the main difference being an expanded perishables section. Tough period to go “upmarket” of course, as the economy tanked at the same time. The point though, is that heavy capital expenditures on store remodels will slow, with about 76% of stores currently being Lifestyle models. Though the company reduced earnings guidance, their expectation for Free Cash Flow remains in the $1.1-1.3billion range. The midpoint would lead to a FCFY(Free Cash Flow Yield) of over 15%, which is a great yield that compensates for the many dangers facing Safeway. I’m buying shares and think they’ll hit the mid-20’s before too long. Gross margin was down 1% from the previous year, as a deflationary food environment continues to pummel grocers like Safeway. Operating and administrative expenses, as a percent of sales, increased almost a percent. Safeway's cost structure is hugely fixed in nature, and they're at the whim of deflationary trends that squeeze margins. What should be clearly impressive to everyone, however, is their incredible 2009 cash flow performance in the face of such pressures. On the conference call, CEO Burd sounded very upbeat and could hardly wait until the March 3rd investor day, when the company will officially give some 2010 guidance. He plans to share data with the investment community that should get people excited about a possible reversal in price trends in their stores. As I've said before, Safeway is in a brutal business. No only that, but a brutal business in direct competition with not just Wal-mart, but other suicidal competitors who can cause damaging price wars. Safeway has high pension expenses and ongoing labor disputes. They also are at the whim of (I keep repeating it) wild swings in food costs that are beyond their control, as well as the consumer "trade-down" effect to cheaper, lower margin products. Safeway fights back on the trade-downs by offering a terrific assortment of their own store branded products, but in categories like liquor and wine they're out of luck. Despite the above headwinds, I still think the stock is a great value. 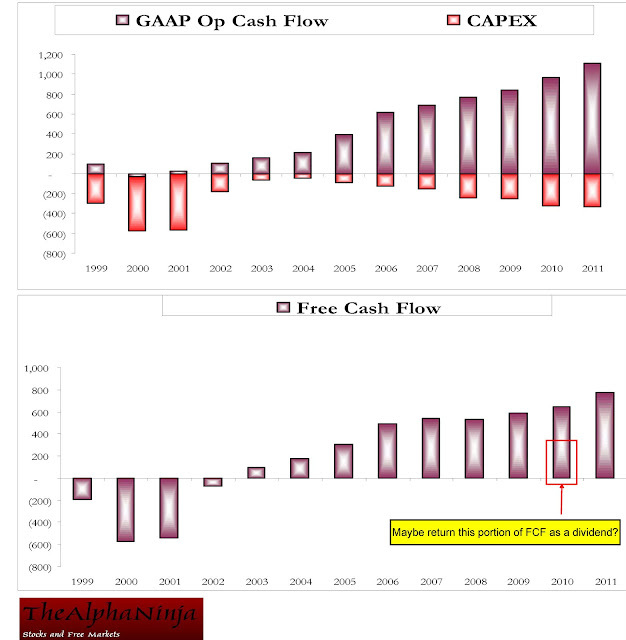 The number one reason to own these shares is that Free Cash Flow is expanding as capital expenditures are slowing. The big investments in Lifestyle remodels are largely behind them, and the contribution of remodeled stores will become more apparent in the coming years. Safeway's strategy has been to grow "wallet share," or the percent of a person's shopping that is done at Safeway. The thinking is that once prices rebound, that same shopper will do the same amount of unit volume, but at higher prices. 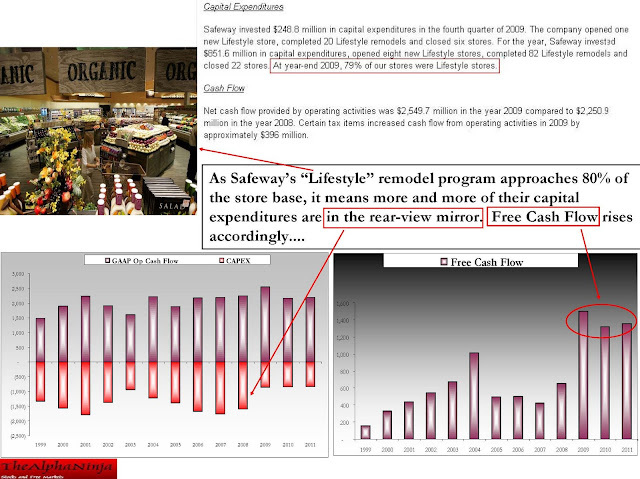 I have pretty conservative Operating Cash Flow Estimates for 2010/2011, but I'm quite curious about Safeway's capital expenditure outlook, which is critical for Free Cash Flow. We'll find that out March 3rd. 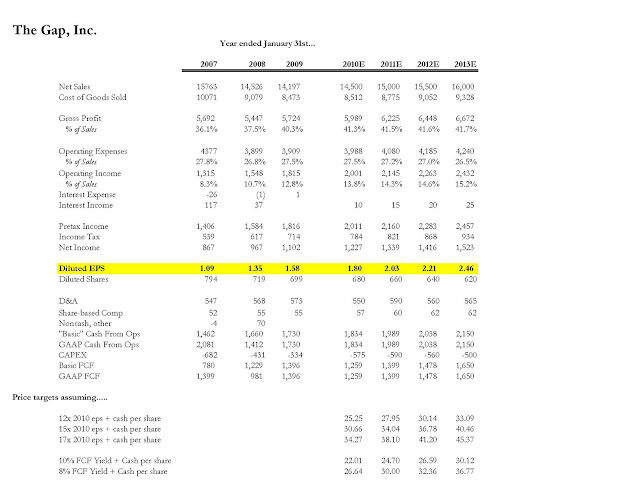 But based on where I am now, Safeway has a current Free Cash Flow Yield of between 12 and 15%. That's more than three times what it costs Safeway to borrow, as their 2019 debt yields 4.6%. A Price-to-Earnings ratio in the mid-teens sends this stock to the upper 30's, and a Free Cash Flow Yield of 10% gets the stock there as well. The market doesn't tend to reward this company with multiples on profits, but their increasing Free Cash Flow Yield will not be ignored forever. Despite the down market, there are some good gainers today. Leading the upside is Coca-Cola Enterprises, Inc (CCE) - NOT to be confused with The Coca-Cola Company (KO). CCE is the bottling operation, and the stock is up 32% on news it will sell the North American bottling business to KO, while agreeing to buy KO's bottling business in Norway and Sweden. KO already owns about 34% of CCE outstanding shares. Complex enough for ya? Oh they will also exchange each share of CCE for a new CCE structure based solely on Europe, and will receive $10 per share in cash. KO shares are down 4% on the news. "Revenues for the quarter and full year are being impacted by slower than expected consumer adoption of the company’s products that has resulted in lower than expected order volumes from carriers and the deferral of orders to future periods. Accordingly, Palm expects fiscal year 2010 revenues to be well below its previously forecasted range of $1.6 billion to $1.8 billion. The company will provide more detail on its financial results during Palm’s third-quarter financial results conference call currently scheduled for Thursday, March 18. ATLANTIC CITY, N.J. – A Florida woman said her love handles saved her life when she was shot entering an Atlantic City bar. Samantha Lynn Frazier said she heard two pops when she walked into Herman's Place early Saturday. The 35-year-old then felt pain and saw blood on her hand after she grabbed her left side. Atlantic City police said Frazier was an innocent bystander. Frazier told The Press of Atlantic City that 'I could have been dead. They said my love handles saved my life." The State Treasurer’s Office pulled a planned $2 billion GO bond sale off next week’s calendar after the cash-flow management bill stalled in the Assembly this week following its passage in the state Senate. That legislation gives state budget and finance officials additional authority to manage the timing of payments for various state programs through the end of fiscal 2011. Lockyer told the committee that bond funded construction projects could dry up by the summer if the state doesn’t get market access. His office has a limited window to act before the release of the governor’s May revised budget proposal, which creates an issuance blackout for the treasurer’s office because of disclosure concerns. “We’ve got until maybe mid-April to try and get to the market three or four times,” Lockyer said. Can you imagine IBM's CEO saying "it is CRITICAL that we sell some corporate debt at current rates, before we release earnings that will cause our borrowing rate to soar"? 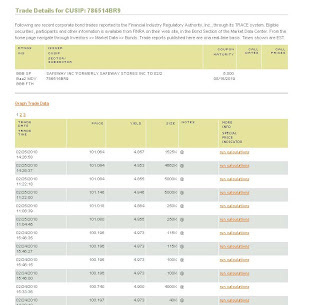 The poor Greeks are being lambasted by international bond investors for various "cash management" tricks, while California goes about its merry business doing the same thing. According to the WSJ, credit rating agency Moody's is saying that Japan's credit rating could be at risk if the government there doesn't reduce deficits in short order. At the same time, there are several factors weighing in Japan's favor, he said. "Affordability for such a high level of debt comes from special characteristics, in particular, a deep and stable domestic funding base, captive savings in the postal savings system and other financial institutions, and a strong home bias among domestic investors." That "deep and stable" domestic funding base comes by way of outright propaganda to buy government debt instead of park savings in higher yielding assets such as stocks. As Kyle Bass of Hayman Capital put it, "Cultural forces spawned the generally accepted belief among Japanese citizens that it is their patriotic duty to lend their government money." 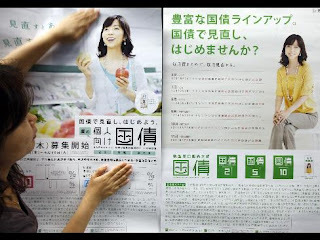 He was referring to ads like the one below, which feature a Japanese celebrity imploring people to buy bonds. It may start with annuities, but the holy grail for big-spendin' government would be forcing Americans to buy another "guaranteed income stream"......treasuries. ION Geophysical (IO) shares are getting a midday lift, after Director James Lapeyre disclosed that he bought 50,000 shares on the open market. Always nice to see insider putting their money alongside other shareholders, as it often signals that they find the stock undervalued. US Stocks are up nicely today. The DJIA is up 101points to 10,383, with only Kraft (KFT) and Alcoa (AA) in the red. "We believe that the first half of 2010 will be a trough period for our business due to an inventory carryover by our largest customer. Although, we believe the marketing programs that we implemented last quarter have had a positive effect on the sell-through of SSDs, based on our best estimates we now anticipate this inventory carryover to continue to negatively impact our sales to this customer during the first half of 2010, as we do not expect any meaningful production orders from this customer during that time. 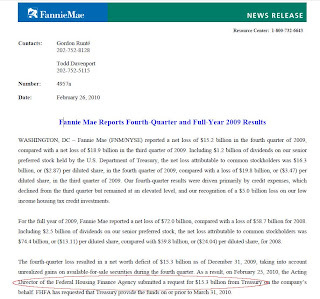 "We currently expect first quarter of 2010 revenue to range from $33 million to $35 million with diluted non-GAAP loss per share to range from $0.11 to $0.13." And as is typical lately, they follow bad news the only way they know how - spending shareholder dollars to repurchase company stock, announcing an $80million share repurchase program. Cell-tower giant American Tower (AMT) reported earnings earlier today. 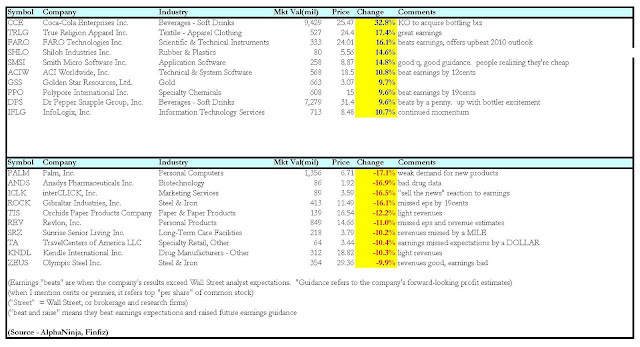 Q4 2009 EPS of 16cents missed the street's expectation by 2cents, yet revenue came in higher than expected. 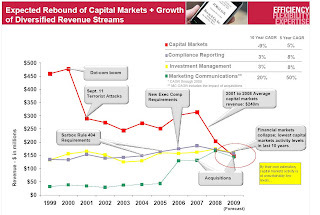 The company's outlook for 2010 looks pretty good to me. Their gross margin, by my estimate(using revenue minus site rental expenses, etc) , increased 40basis points in 2009, from 75.5% to 75.9%. SG&A costs dropped from 11.6% of revenue to 11.3%, so those add up to nearly a point of extra margin. AMT stock of course, is way out ahead of itself, up 57% in 12months. The company does not currently pay a dividend, preferring instead to continue investing heavily in it's network of towers. I know of very few other business models as well-positioned over the coming years as American Tower's - they can leverage each tower with more and more tenants (to a degree of course), as smartphone explosion creates simply mind-boggling need for more bandwidth. American Tower has a great operating model, but it's only a decent stock at the right price. AMT is one of those stories that is LOVED by the PBA community (PBA being "Price-Blind-Argument," which I outlined in my 2010 outlook), but they neglect to mention at what price it makes sense. I don't personally see a reason to own the shares unless the company changes its stance on paying a dividend - not in the cards currently. By my estimates, they could pay out 40% of 2010's after-CAPEX Free Cash Flow, for a dividend of 64cents per share and a dividend yield of 1.5%. Maybe that's what the stock is pricing in, or maybe it's pricing in a higher dividend yield. We'll see. 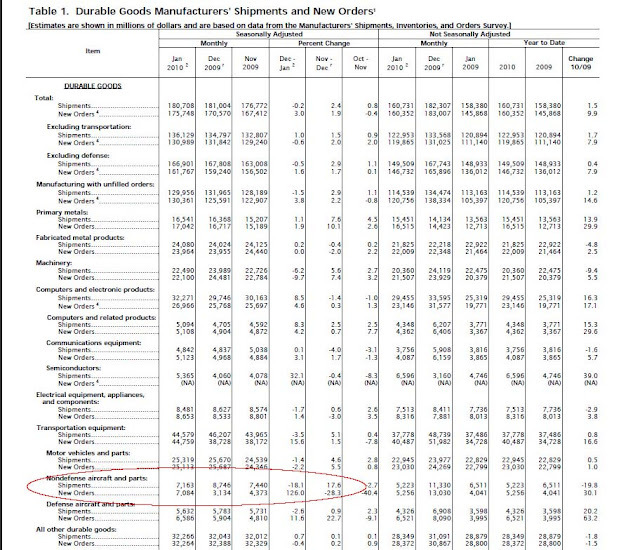 The Census released new home sales data for January 2010 earlier this morning. On an annualized basis, sales are running at 309,000, well below the 354,000 that the consensus of economists were predicting. 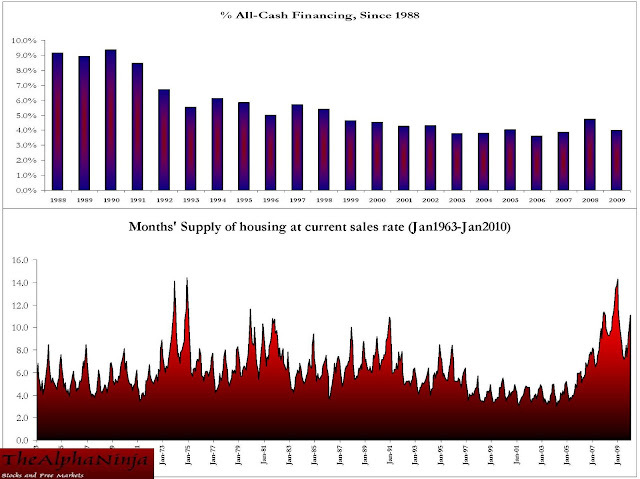 Months supply is still very elevated, and houses are sitting on the market for an average of 14.2months. I also put in a chart of all-cash purchases. They're way down from levels of 20 years ago - as they should be with borrowing rates half of what they were then. KANSAS CITY, MO--(Marketwire - 02/24/10) - H&R Block Inc. (NYSE:HRB - News) today announced preliminary tax season results for the interim period through Feb. 15, 2010. Same-office tax returns prepared in retail operations fell 5.6 percent compared to the prior-year period. Total tax returns prepared through Feb. 15 were down 6.3 percent. Total retail returns prepared year-to-date fell 8.2 percent, while the net average retail fee per tax return increased 1.9 percent. Total digital returns prepared by H&R Block (consisting of H&R Block At Home online and desktop software products, excluding Free File Alliance returns) were down 1.8 percent. Total online return growth of 3.1 percent was more than offset by a 7.6 percent decline in software-based returns. Total digital returns including the Free File Alliance fell 1.4 percent. In light of the foregoing preliminary tax season results, the company's previously announced guidance for fiscal 2010 will not be reached. "We believe industry filings are down significantly due to the recession and sustained, high levels of unemployment," said Russ Smyth, president and chief executive officer of H&R Block. "The weak economic conditions have also contributed to a greater shift to do-it-yourself tax preparation methods among first-half clients. We still have millions of clients to serve in the second-half of the tax season, which we are aggressively targeting," added Mr. Smyth. The investment community expects revenue to be up 1.6% for the April quarter, and earnings per share to be up 7%. The guidance looks to be significantly below those estimates. Appropriately, shares are down 16% in early trading. At an estimated 90 per cent, Google’s share of search advertising in Europe is higher even than its home market in the US, where most analysts put it at up to 80 per cent. The complaint from Ciao, now part of Microsoft’s Bing search engine, centres on Google’s advertising system. While it has always maintained that advertising prices are set by auction, leaving it without any direct influence over pricing, it has faced complaints from a number of companies over its practice of setting minimum bid levels. Given that these complaints will generate interest in the media, we wanted to provide some background to them. First, search. Foundem - a member of an organisation called ICOMPwhich is funded partly by Microsoft - argues that our algorithms demote their site in our results because they are a vertical search engine and so a direct competitor to Google. ejustice.fr's complaint seems to echo these concerns. MILAN (AP) - An Italian court convicted three Google executives of privacy violations Wednesday because they did not act quickly enough to pull down an video online that showed bullies abusing an autistic boy. First of all, congrats to Bowne shareholders for a quick $65% jump in the stock. It was announced after hours today that RR Donnelley would buy fellow printing company Bowne (BNE) for $481million or $11.50 per share. It's a great move on Donnelly's part. Despite paying .71 times sales for Bowne while their own P/S is.42, Bowne is in a higher-end business with higher-end margins. 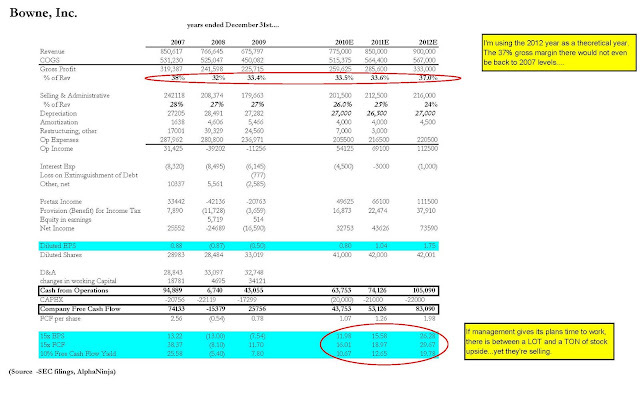 Bowne's gross margin for 2009 was 33%, well off it's 2007 peak of 38% but still way above RRD's 25-26% range. The problem is, despite the 65% premium in the all-cash deal, the price is too low. 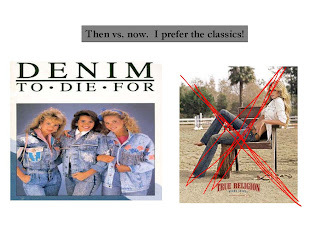 Don't take my word for it, just look at management's December 2009 presentation materials. Ironically, it was for Gabelli's "Best Ideas of 2010" conference. Well with this deal they've got a winner already, but management's chart shows that it's still a sub-par price. Looking at past and future (expected) results, the company is selling low before their end markets pick up. And they don't need to, as they improved their liquidity and financial profile tremendously in the last year. 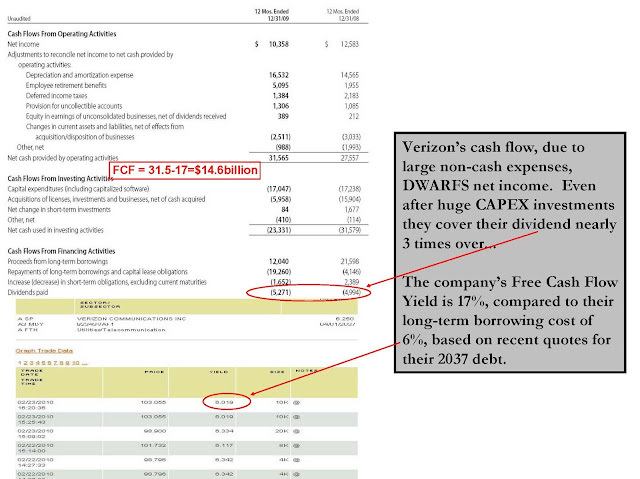 By my estimates, they can blow past 2007's Free Cash Flow levels even without attaining the same gross margin profile. The deal represents a great short term boost to the shares, but Bowne is leaving money on the table. 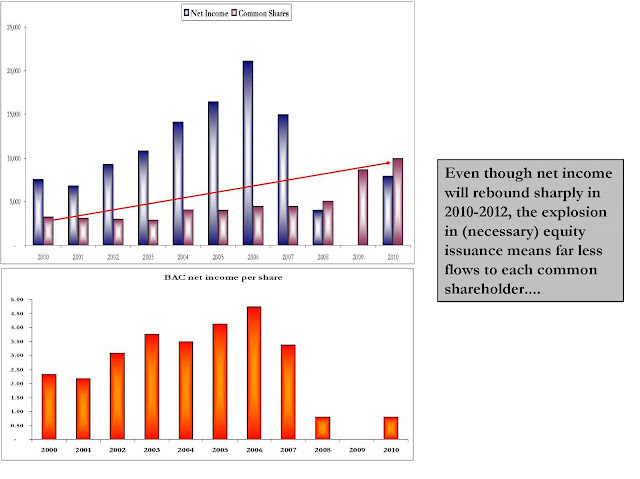 If management is confronted by shareholders who think the buyout is too low, they will NO DOUBT downplay the upside and stress the lower-end level of earnings possibilities, not to mention the slow start in 2010 capital markets activity. There is not a massive concentration of shares held by any one investor (Lord Abbett owns the most, at 2.9million shares or 7.4% of outstanding), but that doesn't mean they won't put up a fight. One last thing. In my estimates below, wherever I might be too aggressive in margin or cash flow assumptions, remember that an acquirer will take out a huge amount of cost here, as well as improving Bowne's gross margin, simply because Bowne's small size hurts it in terms of procurement scale advantages. Mr. Cramer had Verizon CFO John Killian on his show, to discuss the company's big 6% dividend yield. A yield this high normally gets people worried that the dividend might be cut or that capital expenditures must be increased - especially in a capital-intense business like telecom. Killian points out the HUGE amounts the company spends - $7billion their wireless network alone - to keep their networks in top shape, and points out that even after that, they have ample room to protect (and raise?) 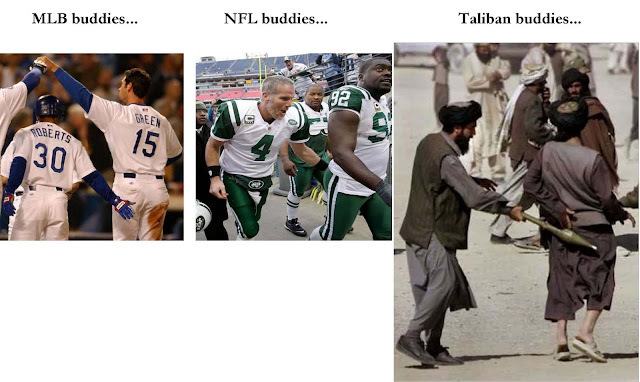 the dividend. You'd think a site called "ETF Prodigy" would at least know the proper Exchange Traded Fund to short oil. 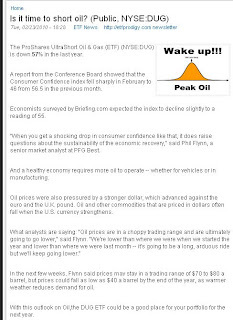 Their MASSIVE error is that while their premise is declining oil prices, the instrument they use is DUG, which will give you short exposure to the Dow Jones US Oil And Gas Index rather than oil the actual commodity. 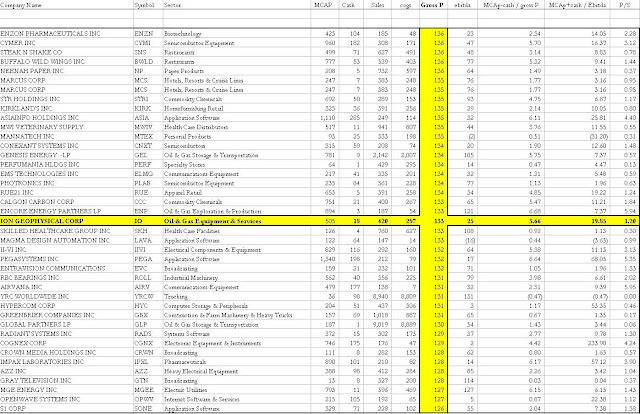 This index is a double short, so it gives you double the inverse performance of the DJ Oil and Gas Index, of which over 37% consists of XOM and CVX (top holdings below). 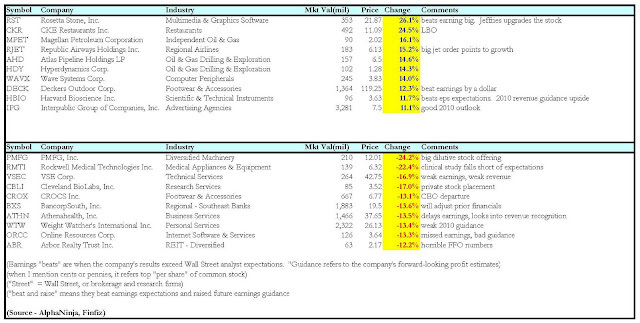 If oil tanks, these stocks may or may not drop to the same degree. For pure crude exposure, DTO is a direct inverse play on downside in the commodity price. Tomorrow's televised, bipartisan meeting to discuss the administration's healthcare proposal will have to be done without the critical cost estimate from the hard-working (I actually mean that) non-partisan Congressional Budget Office. Why? Because the CBO said the bill released yesterday did not have enough detail for them to estimate costs. BAC shares are plummeting as I write this, down 90cents on the day or 4.56%, on news that they'll increase the authorized number of common shares to 11.3billion from 10billion...much of which will be thanks to the conversion of the government's stake into 1.28 billion new shares. As of now there's 8.65billion shares, so the government's conversion into equity necessitates the authorization to increase total shares. -More shares outstanding to split that return among.